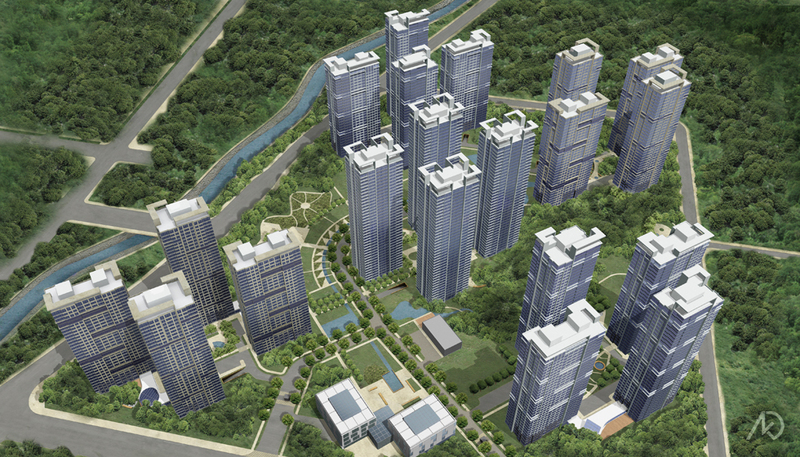 These 3d illustrations were completed in order to coordinate and showcase a holistic design of a residential high-rise development in Seoul, Korea. The development contains five housing clusters. Each cluster surrounds a unique plaza/garden space. The complex also contains a few community buildings, which will house larger amenities such as a public pool and athletic courts. Costas Kondylis and Partners designed the residential towers while the master plan and landscape design was being completed by their partners in Seoul. My job was to produce the finished renderings while coordinating and updating all design changes. The basic building geometry was supplied by the client. The building details and site/landscape was modeled by kk. All items in the scene were textured, and lit by kk. 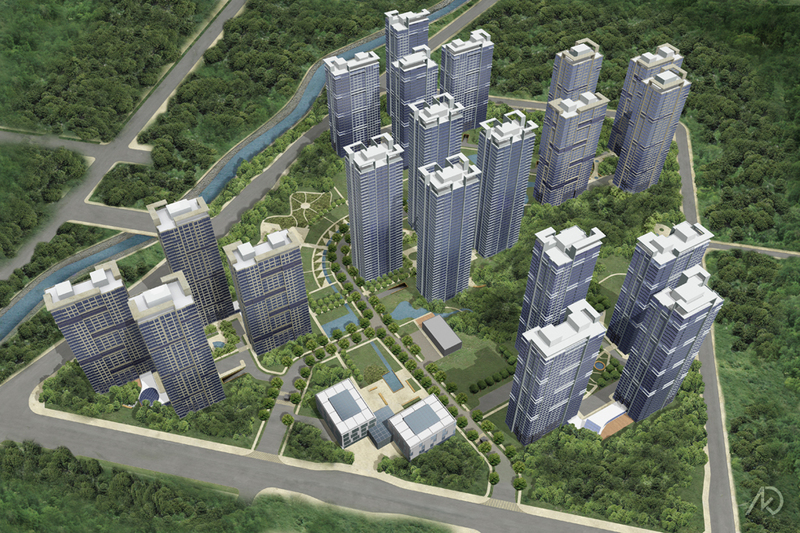 The aerial view shows the five tower clusters as well as the overall site/landscape design. Each cluster is made-up of four high-rise towers, and some type of community building at the base – usually connecting two of the four towers. The cluster shown to the far left of the image is Cluster 01 (see image below), and the cluster in the very middle is Cluster 03 (see image below). This dynamic view looks into the plaza of Cluster 01. From this view one can see the surface parking as well as the entry to the underground parking garage (lower right hand corner). 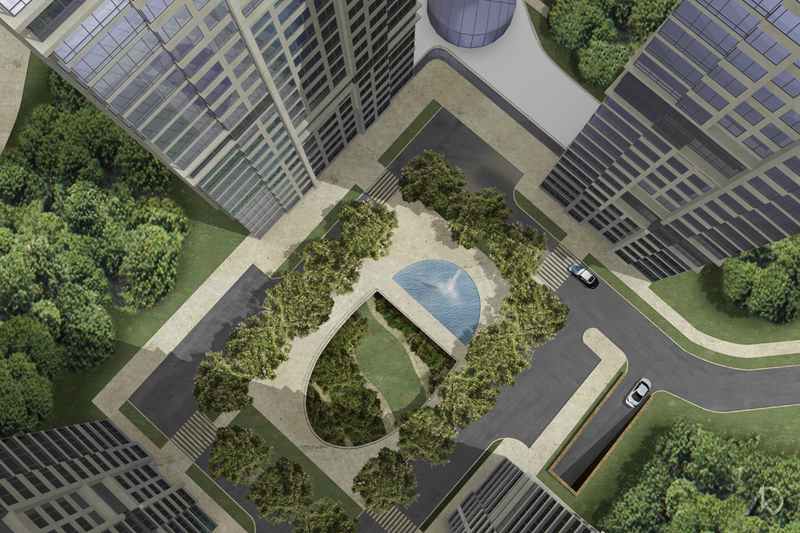 The plaza itself looks down into an elliptical sub-level garden, which is part of the underground parking garage. The plaza also contains a large fountain and reflecting pool. 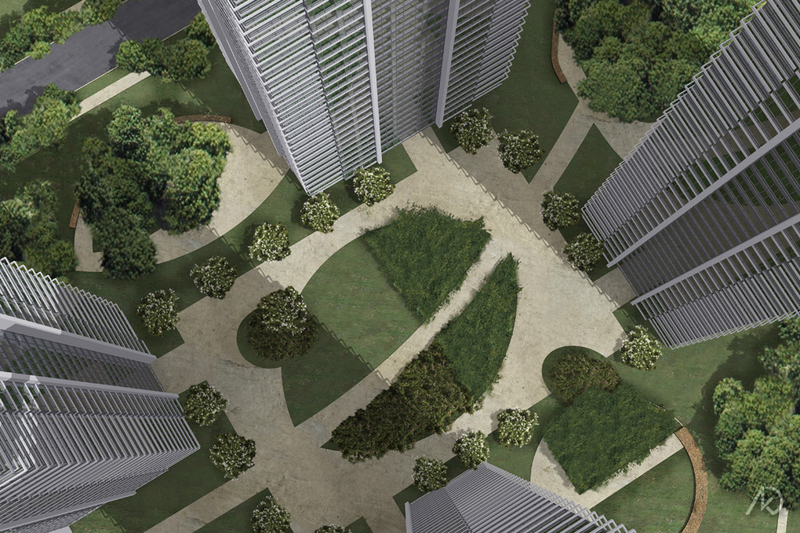 The plaza of Cluster 03 is surrounded by dense wooded areas. The cluster also has areas of lush vegetation, which will contain natural wild grasses and flowers. There is no underground parking access from this plaza, instead it is a quiet pedestrian park/garden. The more dense areas of trees will be fruit bearing, so the plaza will be surrounded by a large community orchard. This image was added so the client could see how large the tower clusters appeared from a human point of view. From this viewpoint one can see the large towers in the background as well as the community building in the front left of the image. 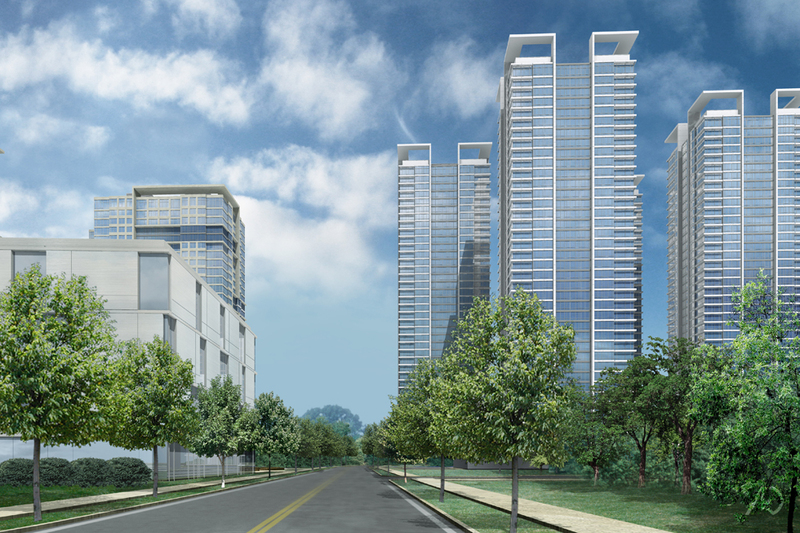 For this exercise, emphasis was placed on the overall look of the towers, the facades, and their site placement.